According to PlainSite, Facebook has been lying to the public about the scale of its problem with fake accounts, which likely exceed 50% of its network. Its official metrics–many of which it has stopped reporting quarterly–are self-contradictory and even farcical. The company has lost control of its own product. Fake accounts click on advertising at random, or “like” pages, to throw off anti-fraud algorithms. Fake accounts look real if they do not follow a clear pattern. This kind of activity defrauds advertisers, but rewards Facebook with revenue. Fake accounts often defraud other users on Facebook, through scams, fake news, extortion, and other forms of deception. Often, they can involve governments. 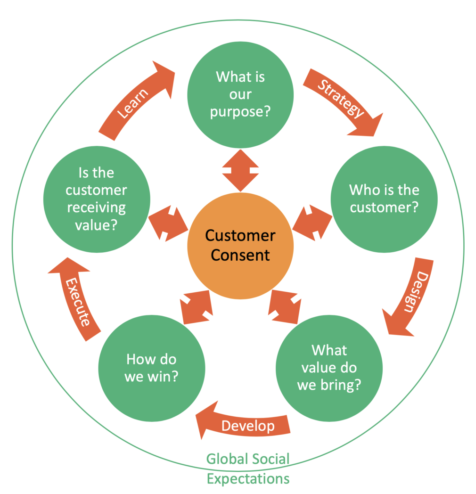 I have joined Mark Blessington and Karl Hellman as partner in a new type of marketing firm, one that’s centered around customer consent. The name of this enterprise, appropriately enough, is Consentric Marketing. The Omnichannel Buyer’s Journey: Who Does It Well? Do Your Content Pages Woo? Learn more about us, and what we can do to help your business grow. Recently, my dear friend and mentor – Professor Philip Kotler (yes, that Kotler!) got entangled in a squabble between Narendra Modi, the Prime Minister of India, and Rahul Gandhi, the dynastic leader of the Congress party. 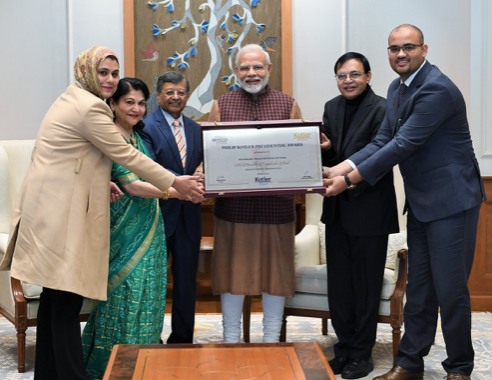 The fun began when Professor Kotler presented the Prime Minister with the inaugural Philip Kotler Presidential Award, an award that recognizes Shri Narendra Modi’s leadership qualities on the global stage. Because his physician had advised him not to travel, Professor Kotler chose his friend Professor Jagdish Sheth, an eminent marketer in his own right, to present the award on his behalf. The award was presented by a delegation led by Professor Sheth on January 14, 2019. Also part of the delegation were representatives of the World Marketing Summit which had held a conference in Delhi in December of 2018. In fact it’s so famous it has no jury, has never been given out before & is backed by an unheard of Aligarh company. Almost immediately, the comments inspired by the post fell into two categories – insults and praise; insults from Rahul Gandhi followers and praise from PM Modi supporters. The tone of these comments was shrill, with many attacking Professor Kotler directly. The government’s press release makes no mention of jury members, nor the exact organisation behind the new award. Even one of my literary heroes – Shashi Tharoor – piled on, going so far as to call the award a fake. Yes, it is real. And why would people like Tharoor assume it was fake? The “journalists” in Rahul Gandhi’s tweet did not follow the first rule of journalism which is – check your facts with the source. How easy it would have been to Google Philip Kotler and contact him through his Northwestern faculty page. Who is Philip Kotler? What qualifies him to give this award? Along with Peter Drucker, Professor Philip Kotler is considered to be one of our greatest management thinkers. Who is the leading business scientist in history? According to the Hirsch-Index its Philip Kotler with an h-index of 163, followed by Michael Porter with 159. Ask any MBA student anywhere in the world, and you will find that they have studied Professor Kotler’s books. He has received 22 honorary degrees from around the world, and published over 70 books. His 50+ years of work with the Kellogg School of Management has resulted in building the #1 Marketing department in the world. Professor Kotler is a man with great integrity and openness. He is also one of the smartest thinkers to grace the planet. He is in the Thinkers50 Hall of Fame (2013), and is featured as a “guru” in the Economist. Who chose the award? Why is there no jury? 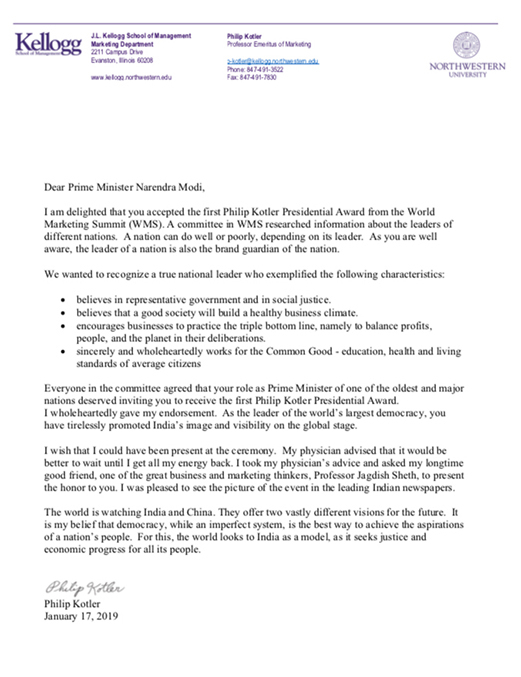 Professor Philip Kotler made the final decision after a committee for the World Marketing Summit came up with a list of possible candidates. Why is Kotler’s twitter account not verified? Because Twitter has stopped verifying accounts, and Prof. Kotler never thought to ask. I messaged Jack Dorsey to ask him if he could make an exception for Professor Kotler. Why was there no mention of the award on the Kotler website? Why was the Indian site for the World Marketing Summit taken down? After an event is over, often times the microsite that’s used to describe the event and/or register participants is usually taken down. The global site for the World Marketing Summit, Kotler Impact and Kotler Awards are still running. What could Professor Philip Kotler possibly know about India? Professor Kotler is not just the “father of modern marketing.” He is an economist and studied with some the greatest Economics teachers on the planet. His involvement with India began in 1955, when he spent a year working on his PhD thesis in India. If the journalists bothered to read My Adventures in Marketing, they might have known that. Since then he has visited India often to teach and speak. What could Professor Philip Kotler possibly know about democracy? Professor Kotler has published books and written numerous articles on capitalism and democracy. See: Democracy in Decline and Confronting Capitalism. Bottom line, I’m disgusted with the trash-talking that I see from the left-leaning Indian journalists and social media participants. 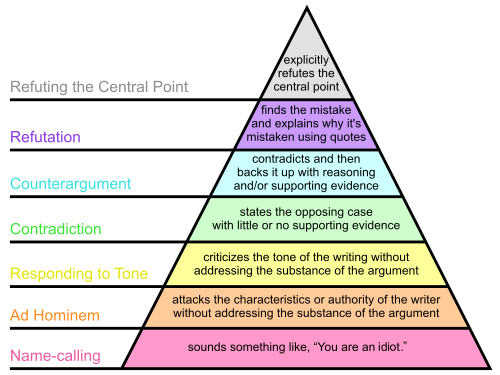 If someone wants to question PM Modi’s track record, they would do far better through Refutation rather than Ad Hominem and Name-Calling. Let that be a lesson for you, young Rahul, and for all who would seek to look childish: focus on the substance instead. Professor Kotler, please excuse the mess caused by this controversy. DISCLOSURE: I have worked and continue to work with Professor Philip Kotler on several projects, including The Marketing Journal, ActivistBrands.com, and FIXCapitalism. We’ve written a book together titled Brand Activism: From Purpose to Action (the print version is forthcoming). No one asked me or paid me (in India, as elsewhere, paid-journalism is a thing) to write this. I simply felt compelled to stand up for a learned man of great integrity.